very thin people with low A1c’s. You are to be envied. The rest of you, please take a look at the maps to the right of your screen. 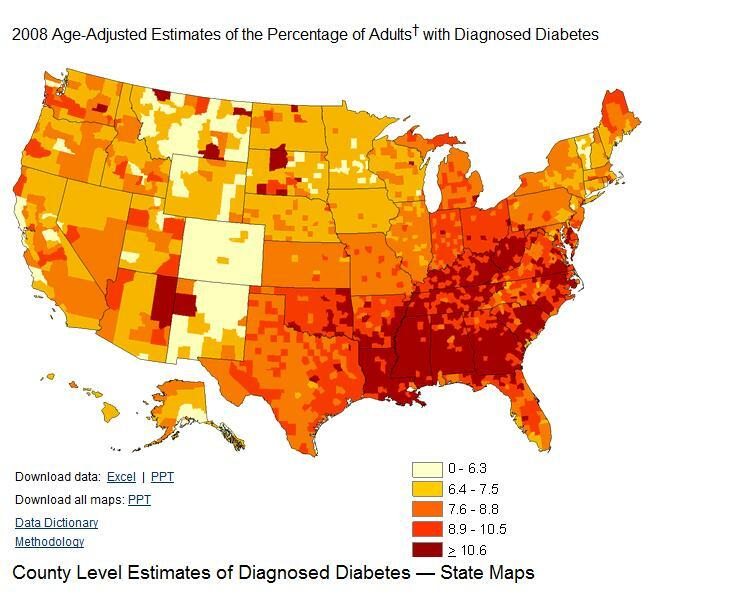 The first one shows the prevalence of diabetes in the US and the second one shows the prevalence of obesity. Both maps are from the CDC Data and Trends web page that is invaluable to information junkies. every day of my life is that I rarely see any teaching about weight loss. Every once in a while I will see, ‘maintain ideal weight’ as teaching in a list of 6 other things copied directly out of a care plan but mostly diabetic diet teaching consists of ‘avoiding concentrated sweets’ – whatever that means. When we talk about diet to any patient on a therapeutic diet, most of the emphasis seems to be on what the patient cannot eat. Many patients have multiple dietary restrictions and frankly if a nurse came to my house four visits in a row and kept adding things to the ‘do not eat list’, I assure you that the agency sending the nurse would have yet another LUPA. Part of planning care is to gather the tools you will need. Every nurse who has ever started an IV in the hospital and didn’t have a Tegaderm with which to secure the line knows that luck favors the prepared and patients do get tired of you holding their IV in place until someone reluctantly brings you the supplies you forgot. In home health, we just wing it. We teach the patient to avoid concentrated sweets and that canned foods are high in sodium. Over and over and over again. And for this, we charge money. Yes, indeed. Life does not get sweeter except that our patients don’t get better. Consider the following resources when teaching diets to diabetics or any patient. Choose my plate is an interactive tool where height and weight are entered into the boxes and a dietary plan is generated. It has multiple supplemental tools that assist in helping the patient choose foods to eat instead of being told what they cannot eat. The National Institute on Aging has a great guide for healthy eating for seniors. The individual chapters are printable so you can take what you need for your specific patient. It has information on how to shop on a budget, nutrient dense food, how much to eat, one chapter on foods that should be limited and how to enjoy meals. This is detailed teaching that goes far beyond ‘avoid concentrated sweets’. Diabetic Super Foods is a great one visit teaching tool to use with a patient who is non-compliant with his diet. It may be easier to get the patient to agree to eat one of the listed foods every day instead of repeating the ‘avoid concentrated sweets’ routine that is apparently not working. Also from the American Diabetic Association is a tool that teaches diabetics how to eat sugar. All of these tools have a ‘print’ button on the page itself. By using that button (usually at the top right), you can avoid printing pages and pages of ads, etc. The purpose of teaching is not to have the patient ‘verbalize understanding’. The purpose is help the patient reach their goals. These teaching guides and others are designed to change behaviors so that the patient can enjoy their life. In order to make it meaningful for the patient, find out what foods he or she likes and then work them into their diet. Find out who does the cooking for them and what kind of budget they have for food. If the patient is not in control of what foods are served in the house, involve the caregiver(s). Teach that diabetes often runs in families and that weight loss may prevent or delay the onset diabetes as well as high blood pressure, joint disease, heart disease and some cancers. Reinforcement of teaching is important as well. This is not done by teaching the same thing every visit, however. Rather, teaching can be reinforced by weighing the patient weekly and making a chart for the patient to see his or her progress. Point out when blood sugars begin drifting down. Bring a new recipe for the family members to try each week. If there is no progress towards goals, step it up a notch. Before your visit, call the patient and ask him or her to tell you what they ate for the prior 24 hours. Enter the data into one of the many online programs that analyze calories and nutrients. Show the patient cold hard data about their diet. If you are so lucky, and it would be rare here in the South, there may be a computer literate family member you can engage in assisting the patient with monitoring his or her food intake. If not, food diaries are excellent tools. You can schedule a phone call to remind the patient to write down his food every morning until it becomes a habit. You can also possibly schedule a recurring email if there is someone in the house who checks email. If you got anything out of tonight’s post, I hope it is that ‘avoid concentrated sweets’ does not cut it as diet teaching. I’m still not sure what that means. If you know of any other resources in the public domain for teaching, please share them here so we can all benefit. Remember to review any tool to ensure that it suitable for your patient. If it isn’t, find another one or make it suitable. Food should be fun. It is an important part of our culture. Families come together over meals and histories are shared over desert and coffee. Food should not be a religion or a stressful event. 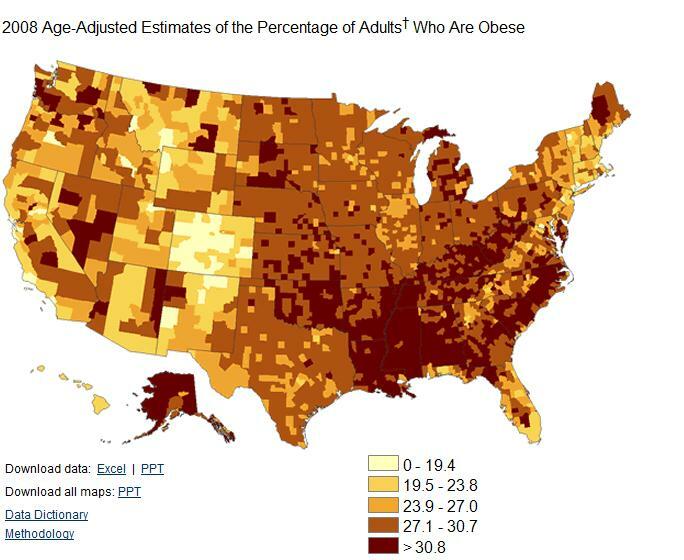 If you live in the South, our food is killing us, apparently. The rest of the country, except Colorado, is not far behind. Oh, and do not go there. Sending your patients to Colorado is not an appropriate nursing intervention on a care plan. hi there…..here is a great website with pictorial, low-literacy handouts. This is a great site. Thanks you so much for sharing.